MorganStanleyGate: You Call This an Arrest Warrant? 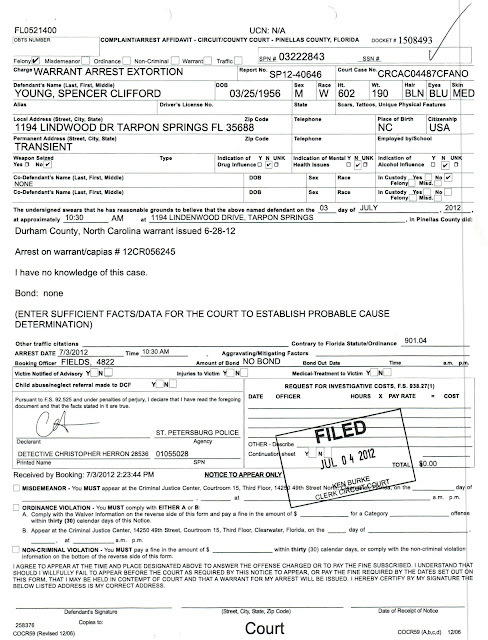 The BOGUS arrest warrant against Spencer C. Young (see below) was issued by Pinellas County's 6th Circuit Court (in Florida), and was solely predicated on a FRAUDULENT arrest warrant issued by Durham County, North Carolina -- it is thoroughly lacking and represents law enforcement run amok. The charges were literally made up out of thin air by Durham District Attorney Leon Stanback (in an attempt to cover up the felonies of his long-time friend and colleague, Durham Judge David Q. LaBarre and LaBarre's girlfriend Leah R. Krier. These charges were later dismissed as meritless, but not until Mr. Young had been UNLAWFULLY incarcerated in maximum security jail with the most violent of felons for 127 days and denied his Constitutional right to his freedom with the posting of bail. This absurd document's lack of particulars in the assessment of probable cause violates the 5th Amendment to the US Constitution, which says: "one cannot be held for a felony without a grand jury indictment nor be deprived of life, liberty or property without due process'. In fact, Mr. Young spenT 65 days in maximum security jail before a completely FRAUDULENT indictment materialized. This arrest warrant further violates Mr. Young's 6th Amendment right "to be informed of the nature and cause of the accusation". Moreover, in violation of the 8th Amendment, Mr. Young was denied his right to post bail for over two months of his unlawful incarceration, and denied reasonable bail for the remaining duration of his 127 day unlawful incarceration. 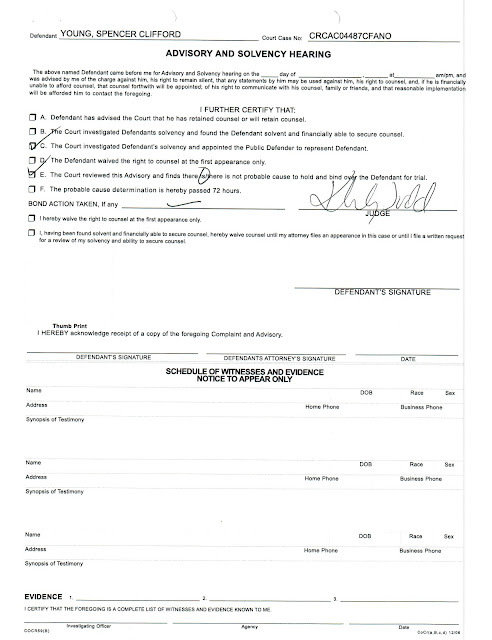 You will note this woefully defective arrest warrant says only "extortion" and "I have no knowledge of this case". This is beyond inadequate . . . this is RECKLESS and INCOMPETENT -- for when denying an upstanding US citizen with no criminal record his liberty and denying him the opportunity to post bail, but not knowing why is in itself CRIMINALLY NEGLIGENT. And yet this BOGUS arrest without bail was signed off by Kimberly Todd, a corrupt (or otherwise profoundly incompetent) Pinellas County Family Court Judge, and adding insult to injury, this was followed up by yet another corrupt Pinellas County Judge Frank Quesada who remanded a thoroughly innocent Spencer C. Young to maximum security jail with the most violent of felons (where he was regularly tortured and received death threats), and later learned to be pursuant to the oversight and direction of the then profoundly corrupt Chief Judge Thomas McGrady.